If you're in the midst of a summer pregnancy, chances are a baby shower is in the near future—an exciting event to look forward to, no? With games, gifts, tasty food, family, and friends galore, the celebration is, well, all about you and your new baby, mamas-to-be. And as such, the day should be completely stress-free—for you especially. Now, with the majority of the party planning in the hands of your besties, there's only one thing expectant mothers need to focus on—attending and doing so in serious style. 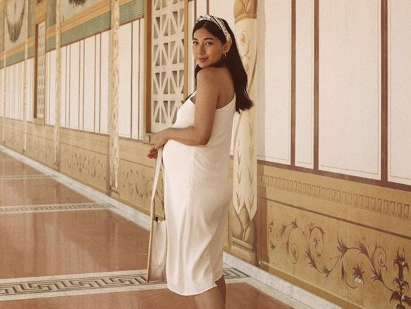 So to help ease any of the stress of figuring out what to wear, we've rounded up 15 stylish maternity dresses for the mom-to-be to wear to her baby shower. From a pretty, romantic floral number to an elegant black shift dress, we're sure you'll find an option in the mix that will fit your style preferences. Read on to see and shop the best maternity dresses for a baby shower.